I have always loved to draw. Like most artists, I look and take in what’s around me. For the past five years, I have been working in encaustic (hot wax) painting. 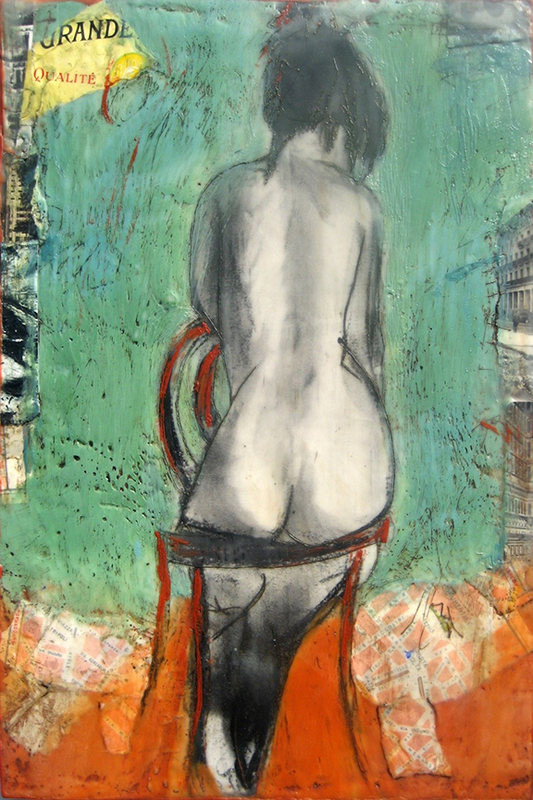 Painting in encaustic highlights the lines and tonal quality of my charcoal drawings of the figure and nature. I had the opportunity to travel to England recently and found that (besides missing my family) I missed my paintings! I missed looking at my paintings up close. Up close, I see the texture on the surface, further emphasized by oilstick on the drawn lines and brushstrokes. Adding collage elements gives more texture, dimension and depth to the paintings. My drawing is an appreciation of the life, personality, spirit and beauty of humanity and nature. I select which drawings I’d like to use in an encaustic mixed media painting. 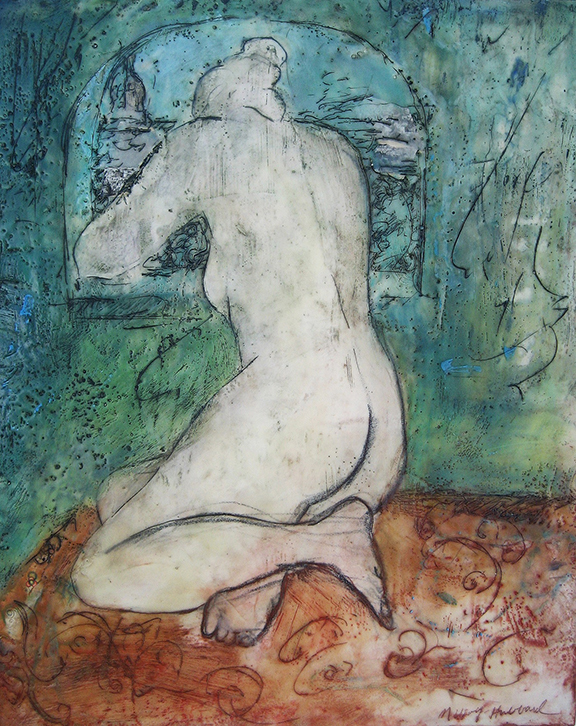 I adhere the drawing (usually charcoal on paper) to a wood support, then paint in layers of clear encaustic medium, fused to the layer below to embed the drawing in wax. I work on an electric griddle and use it as palette. I’m able to mix colors on the griddle and paint with a brush. The encaustic medium is a combination of beeswax and dammar resin. I can add the clear encaustic medium to other pigments, or encaustic paint for more transparency. I use collage elements such as postcards, found objects, and handmade papers in the paintings. I draw into the wax with an incising tool and add oilstick to the lines and the rest of the painting. I received my B.A. from the University of Maryland in Studio Art and studied Fine Art and Illustration at the Maryland Institute, College of Art. My paintings have been exhibited widely on the East Coast. I have illustrated for magazines and books and worked as a courtroom artist. I am an instructor at Glen Echo Park, the Yellow Barn Studio and The Smithsonian. I also teach art in my studio at Pyramid Atlantic Art Center. I am a teaching artist in the community, working with children and adults including individuals with special needs and seniors with dementia. My husband, David Hubbard, and I have collaborated on a children’s book, The Shiny Shell, an eco-adventure book about a boy and a dolphin on a mission to save the oceans. We are currently working on a series of books of David’s short stories and poems and my encaustic paintings, which have inspired David’s writing. Poems From Within is the first book in the series.